1 Why Do I Need A Heated Bird Bath? It’s never too early to think about upcoming needs, and for many of us, a heated bird bath is on that list. Some are stylish and have tons of visual appeal. Others are a bit more sedate and merely do exactly as advertised: they keep the water from freezing. Let’s explore all of the important details of bird bath heaters, and go over everything you could ever need to know before buying one. I’ll make suggestions for some of the best that are out there, and you can prepare in advance for the fall and winter months! 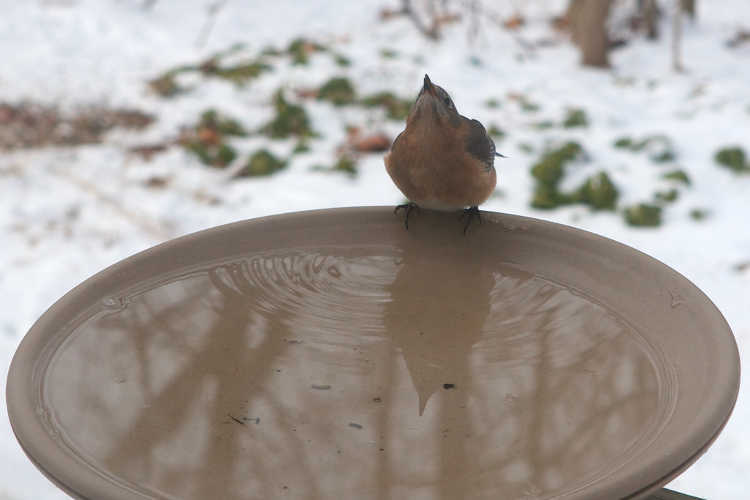 Unlike other devices, there is not a best heated bird bath. It really depends on your personal needs and your available space and preferences. But there are a lot of high-quality options available, and I’ll talk a little about each. Why Do I Need A Heated Bird Bath? Does it seem like a luxury to have a heated bird bath? Is it just a spa treatment for wildlife? Are visions of hot tub resorts for bluejays floating through your head right now? Silly as it might seem, a heated bird bath is a good investment. Remember, birds are some of our best pest killers. 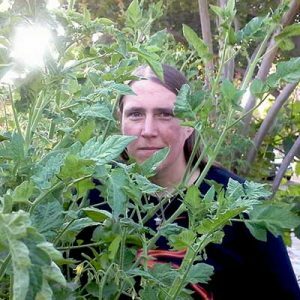 They can be a nuisance, especially with fruit trees, but the rest of the time they happily pick caterpillars off of plants and demolish beetle populations. Having birds around is important to most gardeners. But you don’t want just transient birds. You want some who will stay. 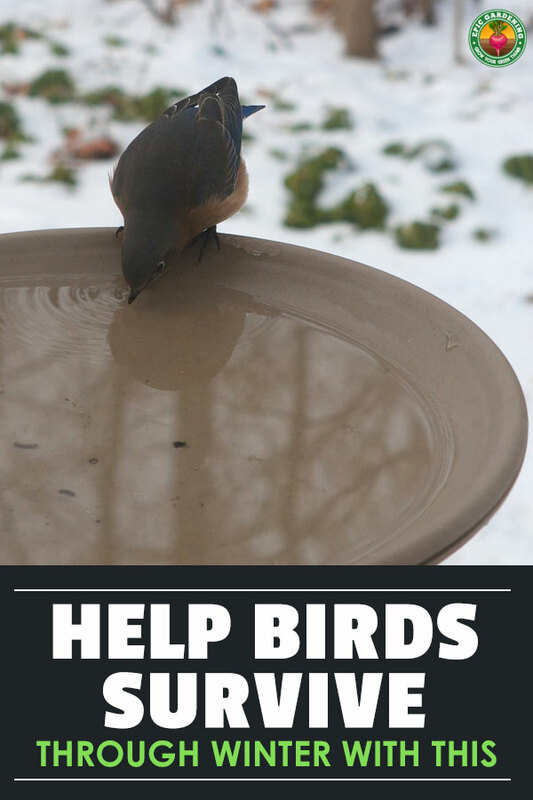 What a heated bird bath does is to provide a year-round environment where your birds will be able to find the water that they need. Having one ensures that the birds stick around at least through the winter, and makes it much more likely that birds will stay in spring. Creatures of habit, birds stay where they have an inviting environment. If they have a reliable source of water, and a source of food from a bird feeder, they’ll nest in nearby trees and shrubs. You’ll have generations of birds to guard your garden! A product like this is a necessity anywhere where you have regular frosts and freezes. This prevents a giant ice cube in the yard, as it keeps water from freezing. In the coldest sub-zero weather, the worst you’ll have is a thin crust that the birds can easily break through to drink. Most heated bird baths come as either a bowl model, or one on a pedestal. For those which are bowls, there are stands available to place on a table, or mounts which hook it onto your deck railing. Some of the mount brackets allow for the bowl to be tipped to drain it, which can be a nice perk once your bird bath bowl is attached. Others are fixed, which can be good if you have rambunctious squirrels that might visit. Pedestal models often hide the cord joint inside the base to keep it out of the weather, which can alleviate the need to add some form of watertight cord protection. Typically more expensive, these bird baths have a nice finished look. Pedestals also have bowls which are heated from beneath by a heating element. These keep your water liquid throughout the winter without any problems, as the bowl itself will be warm to the touch. While there’s a lot of interest out there for solar bird bath heater models, they can be difficult to find except in specialty stores. These also run the risk of not getting enough light during the winter months to really act as a heater, so I don’t typically recommend them. There are immersion heaters which can be added to many non-heated baths, as well. These work by submerging a waterproof plate in the bath, keeping it at a regulated temperature. With these it’s important to be attentive to the state of the cord so it doesn’t get damaged and hazardous. 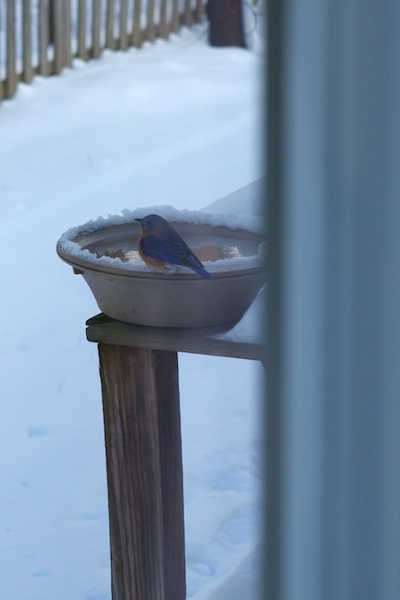 Place your heated bird bath outside once the weather gets chilly, but before the frost starts. When snow falls, be sure to clear off any snow on the rim so birds have a place to land. Keep water in your bird bath at all times when it’s on. This ensures that the bird bath continues to work properly. Leaving it on without water causes heating elements to malfunction. It also causes warping in plastic bird bath models. Put your heated bird bath in an area where it gets sunlight. The sun’s rays will help it work more efficiently and with less power use. Avoid placing immersion heaters in concrete bird baths. It seems like it would work, but the concrete pedestal will be sub-freezing temperatures while the heat plate will be hot. This causes concrete to crack, and stone can have similar problems. Clean the bowl of the bird bath regularly, even during the winter months. This prevents mineral deposits from forming and guarantees that the water is always clean and safe for the birds. Never add salt, antifreeze, or other chemicals to the bird bath, as they can be toxic. Be sure that if you use an extension cord, it’s designed for outdoor use. Outdoor extension cords have a much thicker exterior and can stand up to the weather. Also important is sealing any connections between cords with either a waterproof cord joint protector or a thick layer of electrical tape. Any water that can seep into the gap between the cords is a potential spark risk and may cause a fire or damage to your bird bath. If your bird bath sits beneath fence planters or under tree branches, regularly clear any debris out of it to keep the water clean. Featuring an internal thermostat that will keep the water from freezing no matter the temperature, this simple bird bath bowl comes without a stand. Simply place it on your own stand (or build a stand for it), fill it up, and plug it in. It’ll handle all the work. While this does come with a bracket mount, this looks great even if set into a pile of stones or on top of a clay pot. It’s formed out of a hard resin, so it will last for years to come. This one’s designed for tabletop use, and it looks wonderful. Made to resemble stones, it’s coated in a fine layer of sand to give it texture and make it easy for bird talons to grip. An internal thermostat keeps the water liquid. No stand is necessary for this model, and it can be tucked into a garden surrounding and blends right in with the scenery. Due to the sand coating, cleaning takes a little longer, but it’s still relatively painless. Very similar to the standalone bowl style mentioned above, this bird bath includes a mount to attach it to your deck railing. Constructed of a heavy resin plastic, it holds up to abuse and weather well. The power cord stores beneath the unit during dry months. The bracket is a “tilt to clean” style, which means it’s easy to pour out the water held inside and rinse it out. Again, like the others, a built-in temperature gauge will ensure that your water never turns to ice. And it looks great once in place! 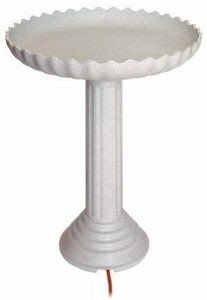 If you’re looking for something a bit more decorative, this scalloped-edge birdbath may fulfill your needs. Designed to bolt onto a deck railing, its bowl can be removed by unscrewing it from the base. The heating element is built right in to the molded shape. Unlike some other styles, this one doesn’t have a longer cord. Instead, you simply plug in your outdoor extension cord directly to the bird bath. As it’s hidden underneath in a partially-enclosed well, it will be protected from most of the elements. 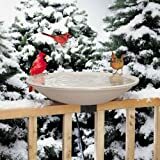 This heated bird bath is a bit less decorative than other units, but can be used with the included clamp, the included deck mount, or directly placed on the ground. This gives it a little more variability than some other models. Good to -10 degrees Fahrenheit, this is best used in areas with light snow and cold but not sub-Arctic temperatures. Its thermostatic control will automatically warm the water when it’s necessary to keep it liquid and ready for birds. Very similar to API’s deck-mounted bird bath, the EZ Tilt-To-Clean model holds quite a lot of water. Deck-mounted, it’s sized to fit 2″x4″ or 2″x5 7/8″ railings. The cord can be tucked into the base when the weather is warm, making this a year-round option. The poly bowl is solid and can stand up to all manner of weather, making it another great choice! 1-3/8 Deep and 14-1/4 diameter. This model is a bit pricey, but you certainly get what you pay for. Beautifully done in wood with a double heating element built into the bowl, Songbird Essentials has provided a quality pedestal-style heated bird bath that will look great in any surroundings. A couple drawbacks do exist, though. This arrives “some assembly required”, so you’ll need to put it together yourself. Because the extension cord runs through the stand, it can be difficult to lift the bowl more than a couple inches to dump and replace water. All in all, this is still definitely worth considering, and is one of the prettier models available right now. This is the one I’d personally pick. Dimensions: 20L x 20W x 24H in. Focusing on design, this bird bath provides a beautiful ivy-leaf stand that can be worked into a lot of flower gardens seamlessly. The bowl is crafted of ABS plastic and is built to last no matter the weather. 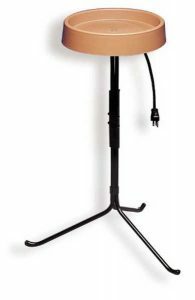 I love the concept of this piece, but unless you’re a master at hiding your extension cords, the biggest drawback I can see is that your cord may still be visible when this model is plugged in. If you plan on having it out in the open and not in a corner, you’ll have to get creative! Did you like the look of the scalloped deck-mounted bird bath I mentioned earlier? This is the same model, but mounted on an included pedestal base. I actually prefer it on its pedestal over the deck-mounted format. Something I didn’t mention earlier is that this model has a 120-watt heating element. It’s been tested to -20 degrees, and worked beautifully. So if you’re looking for something a bit more classic in styling, this heated bird bath will blend right in. There are some serious pros and cons with this model, and it really depends on how you plan on using it. None of those problems are in the bowl itself, which is one of API’s standard heated bird bath models and which works beautifully. Problems I can see include the stand getting knocked over by random wildlife (cats, dogs, squirrels) when it’s not completely full. The narrow legs may also sink into muddy ground, making this best used on a solid surface. And it’s just not the prettiest variant out there. But if placed on a deck or balcony, this is a great design, and definitely worth considering. If you have a romance period garden, and are looking for the perfect pedestal to fit in your design constraints, this is the one for you. A fluted vase-like pedestal supports one of API’s solid bowls, with the cords hidden in the pedestal stand itself. And it looks great. I really can’t fault much about this model. If I wanted a classic, streamlined birdbath look, this would be the model I’d pick, as it elicits the same visuals as the concrete or marble birdbaths of years gone by. Do you have limited space, perhaps on a balcony? If so, this will be perfect for you. The API 400 has all of the same problems of the API 970 that I’d mentioned above, but with a much smaller bird bath mounted on top. The lack of water weight in the bath will make this much more prone to accidental tip-overs. Having said that, apartment dwellers may cheer, as this takes up less space than other models and still draws the wildlife in. It may not be ideal in all environments, but if you’re in close quarters, you will like this one. Immersion heaters are not the prettiest things in the world, but for what they are, they’re useful little devices. Allied’s model is solidly-built and designed well. It won’t overheat if the water level drops too low, which is one of the major hazards of an immersion heater. Having said that, it’s also a bit on the bulky side. This is mostly to protect the birds that may land on or near it, but you’ll have to be creative in how you set it up to make it less visible. A deeper bird bath may be your best bet with this and other immersion types. As far as immersion heaters go, this one is one of the least-visible models when in use. It has an enamel surface which can be painted to blend in, and it is designed to sit squarely in the center of the bowl. My largest concern with this model is that because of how it’s designed, you may still end up with large snow or ice pileups around the rim of your bird bath, especially if you have a wide, shallow-bowl model. And this style needs to stay submerged when in use so it doesn’t overheat. The Farm Innovators immersion heater is designed much like a heater for a livestock trough. Constructed of aluminum, it is utilitarian and no-nonsense, but it works extremely well. This will not win awards for style, but what it will do is to keep the water in your bird bath slightly warm and liquid. Because of how it’s constructed, it’s meant for much deeper bird baths, so if you have a shallow one, I’d steer clear of this model so you’re not constantly refilling. I hesitated before including this one on the list, but opted to do so simply because API has great customer service. So first, the pros: The design of this bird bath deicer causes good water circulation while keeping the ice melted. As it’s round, it fits into the bottom of the bowl well. However, there are some drawbacks. The cord housing tends to stick out and be visible, and while these have a three-year limited warranty, they tend to fail after a year to two years. Keep those receipts on hand, because you may need to contact the company for a replacement! There are a few things that might be useful in addition to your heated bird bath, so I’m including a short list here! Let’s be realistic: you want a watertight seal around your cord ends so no water can seep in and wreak havoc. Farm Innovators has the sturdiest watertight cord lock setup I’ve ever used, and it’s well worth the money spent. For a slightly different variation on a cord protector, Westinghouse’s model is decent. It runs about $1 less than the Farm Innovators model. However, it’s less sturdy and will need to be replaced in a couple years. For most of the heated bird baths we’ve talked about today, you won’t need one of these. But for any of the immersion baths, you may want to consider the Thermo Cube. This outlet senses the ambient temperature outside and turns on the power only when it’s needed. There’s different models rated for different cold requirements. If you don’t mind a light crust forming on the water, the model that turns off at 30 degrees is fine. Those who want the water liquid all the time should choose the model that turns off at 45 degrees. In the end, ensuring that your local bird population (and maybe your local rabbits or squirrels too) has water throughout the winter months can be rewarding. Whether you choose to use your existing bird bath with an immersion heater, or select a new model, there’s something for everyone here! 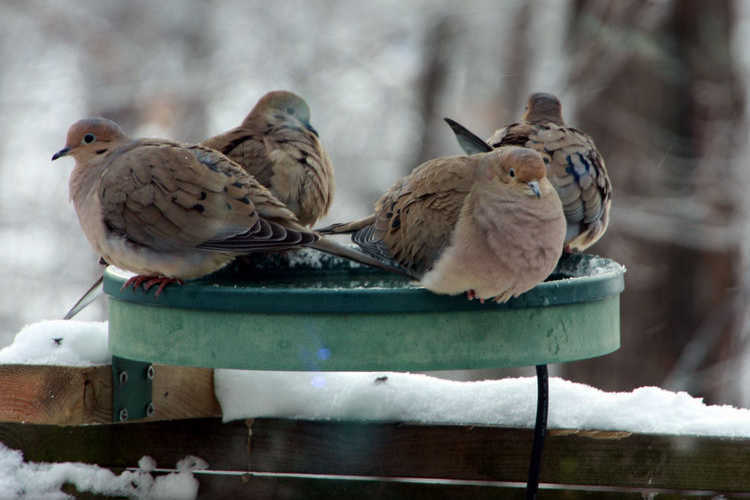 Do you use a heated bird bath in the winter months, and if so, what have your experiences been? Let me know in the comment section!